Mangrove forests in Pred Nai, Trat province, Thailand. 2012/12/07 – This was the theme of one of the side events on Forest Day 6 in Doha on December 2, 2012. A panel of well known coastal and marine ecologists, sociologists, policy makers, and environmentalists in Doha shared their thoughts and reminded everyone present about the importance of the mangrove and other marine ecosystems in climate change mitigation and adaptation. The capacity of mangroves, seagrasses, and salt marshes to sequester carbon dioxide from the atmosphere and deposit it in a reservoir is becoming increasingly recognized at the international level. Of all the biological carbon, also termed as “green carbon” captured in the world, over half (55%) is captured by marine living organisms, also known as “blue carbon.” Mangroves, salt marshes, and seagrasses form much of the earth’s blue carbon sinks. They store a comparable amount of carbon per year to that of all other plant biomass on land. Quoting the findings of a study conducted by a team of researchers from the U.S. Forest Service’s Pacific Southwest and Northern research stations, University of Helsinki, and CIFOR, one of the panelists shared that per hectare mangrove forests store up to four times more carbon than most other tropical forests around the world. Research attributes this ability of mangroves to store such large amounts of carbon, in part, to the deep organic-rich soils in which it thrives. Mangrove-sediment carbon stores were on average five times larger than those typically observed in temperate, boreal, and tropical terrestrial forests, on a per-unit-area basis. The mangrove forest’s complex root systems, which anchor the plants into underwater sediment, slow down incoming tidal waters allowing organic and inorganic material to settle into the sediment surface. Low oxygen conditions slow decay rates, resulting in much of the carbon accumulating in the soil. In fact, mangroves have more carbon in their soil alone than most tropical forests have in all their biomass and soil combined. However, despite such a substantial role of mangroves in absorbing atmospheric carbon, all the panelists unanimously agreed that mangrove forests have yet not been given due attention in the global debate on climate change. They need much more attention in the UNFCCC climate change talks, on the level of that given to other forest ecosystems, such as terrestrial forests and peat lands. Interestingly, in a way, mangroves combine both, tropical and peat land forests together, and have the highest productivity of any forest ecosystem on earth. Mangroves perform a variety of useful ecological, bio-physical, and socio-economic functions. They not only serve as breeding grounds for a variety of fishes and other marine fauna, but also protect the inhabitants of coastal areas during natural calamities such as storms, typhoons, and tsunamis, by serving as natural barriers. Such natural calamities are projected to increase in future due to increased anthropogenic pressures, and climatic changes. From a socio-economic point of view, mangroves provide a variety of benefits. Serving as a breeding ground for fishes and other marine fauna, they provide an income source to the local fishermen communities, while mangrove wood is used to make charcoal and also as wood fuel for cooking. Values of mangroves for honey, fodder, edible seeds, and medicinal properties have also been documented widely. 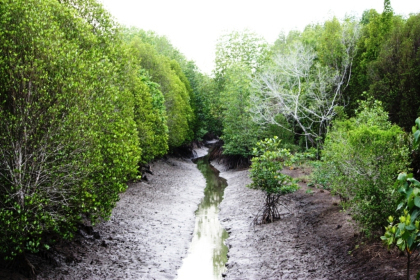 Thus mangrove forests play both, mitigation and adaption functions in the changing climate. But unfortunately mangroves are being rapidly destroyed all over the world, at a higher rate than tropical forests. The range of anthropogenic pressures on mangroves are on a constant increase. For example, Southeast Asia, which has 22% of the total mangrove cover in the world – the largest share amongst all the 124 countries in the world – faces severe pressure from commercial shrimp farming and charcoal making. Every year thousands of tons of shrimps are exported to the western markets. Looked at another way, this means transporting carbon to these countries, as shrimps are reared at the cost of cutting down thousands of hectares of mangroves. Due to the cutting down of mangroves, the wet soil dries up very quickly, releasing more carbon into the atmosphere, at a substantially higher rate, as mangroves have more carbon in their soils. Estimates suggest that a range of between 150 million to 1 billion tons of CO2 is emitted annually due to the destruction of mangrove forests globally. All these are important factors to consider when pushing the agenda forward to include mangroves in climate change mitigation and adaptation frameworks. In this context, RECOFTC’s work in promoting community based conservation of mangrove forests in Pred Nai village, Trat Province on Thailand’s eastern sea board (through its Thailand Country Program) is an important intervention and contribution to promoting a participatory approach in the conservation and management of mangroves. The Thailand Country Program of RECOFTC continues to work in Pred Nai village and has recently initiated a grassroots level, community based learning center there. This network of natural resources and environmental conservation initiatives links and establishes communication between concerned units at the provincial level and community members who play a vital role toward natural resource conservation in Trat. These efforts also promote policy support for local authority decentralization, and provide technical and technological support to local officers on natural resources management planning, and strategies on strengthening community self-management. This is an important initiative to better understand the roles of mangroves in local livelihoods and also for climate change mitigation and adaptation at the local level.